40.63 acres of former pastureland donated by Barbara Beaumont and Kurt Hamann. This property features steep rolling terrain, with large sweeping mature oak trees. You can find a huge boulder slowly working its way down the watershed towards Muddy Creek. If you sneak in quietly you are likely to flush a rafter of turkeys. Or a herd of white tail deer. Do not cross the creek to the north or east. The fence on the south of the property defines the boundary between Bur Oak Land Trust property and Coralville residents. 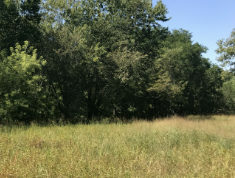 The boundary on the west is currently defined by dilapidated fencing, when in doubt move to the east away from private property until stewardship staff can mark the boundaries more clearly.